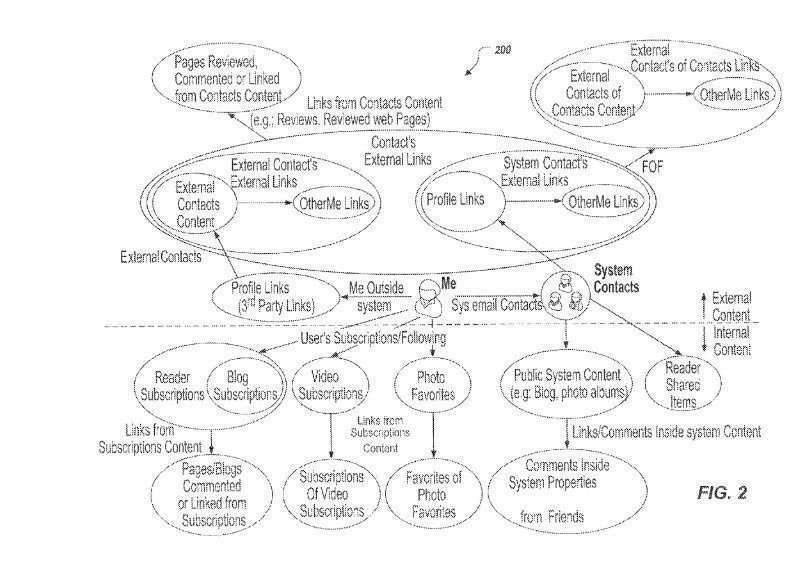 A couple of years ago, Google published a patent that described how the search engine migh rank user generated content in something like Google Plus. I wrote about that in the post, How Google Might Rank User Generated Web Content in Google + and Other Social Networks. A few days ago, Olivier Duffez mentioned my name in a Google+ post he titled How Google+ internal search engine work? in which he pointed out a Google patent. I responded, promising that I would take a look at the patent see if it did indeed tell us more about how content at Google+ was being ranked and rated in searches. Interestingly, The patent refers to a person’s contributions to Google+ as part of an “Activity Stream”, which is what Google recently started calling the stream of content that people share with each other at Google+. Methods, systems, and apparatus, including computer programs encoded on a computer storage medium, for receiving, from computer-readable memory, a particular item of digital content distributed by a user through a computer-implemented social networking service; identifying, using the one or more processors, a set of items of digital content distributed by the user through the computer-implemented social networking service; receiving interaction data from the computer-readable memory; determining, based on the received interaction data, at least one of a user ranking score associated with the user and an item ranking score associated with the particular item of digital content; and storing the at least one of the user ranking score and the item ranking score in the computer-readable memory. It appears that in addition to ranking users of a social network, the digital content that they share might also be ranked, and that can determine the order it is shown in a stream or in response to a query at Google+. Yes, this patent does look like it may describe how different users are ranked at Google+ and how items might be scored by this system determining what gets returned in response to a query. It doesn’t seem like a surprise that content shared by an individual that seems like it encourages others to share or comment upon that content are the higher ranking users, and content that is the mos interacted with tends to be the highest scoring items. This ranking of users is already happening in yelp, where the users who gave maximum and genuine reviews, have a higher rating and yelp accepts any review from them with out much filtering. But rating of social media users would make it even more interesting, inspire them to contribute even further.Highly rated users might be much sought after for marketing campaigns. It seems like users will also have their authority when it comes to social profiles and Google is trusting signals from those users related to particular niche in determining user generated content ranking. This is a good move but this has to be made fool proof. What do you think, Bill! Does it apply also for G+ business pages? This should be interesting! Thank you. That’s a really good example of how a ranking of users in a social media setting (and yelp membership is social media) can benefit an individual and a site. Someone who is highly ranked in Google+ might be seen as an influencer by others in Google+ by how they do actually influence others. The patent doesn’t distinquish between individual users or business users. So I would venture forward with the idea that it would apply to business pages. There likely are things that Google applies that aren’t in the patent that look for fake profiles and people attemptiing to game the system. I think you’re right that Google needs to make something like this user ranking and item scoring fool proof. Thank You for being there for the people. Thank You for making a safe place that we all look forward to visiting daily. Thank You, I love Google Now and Google’s people. Thank you for the opportunity to be part of your system. I believe ranking of user’s will bring every thing together and everyone will try harder to be particularly useful in the system. Thank you! Hey Bill as usual something interesting and useful for us mere mortals to soak up, it will definitely be very interesting to see how this one plays out but I would think Google have very little interest in putting much resource’s into such areas especially after losing in the social media game with the G+ platform, also ranking users via shared, interacted on and endorsed content in this “content marketing era” just seems like a though one to police without any major flaws what you think ? Your site has been amazingly helpful in my journey with SEO thus far. Authority scores and contributiveness scores! Google is bound and determined to make sure that people will contribute useful information whether theyâ€™re asking a question, providing an answer or offering information, a product or a service. Googleâ€™s vision is for a utopian virtual world where everything runs like clockwork. The only thing that anyone can focus on is to continue providing useful and relevant content. Itâ€™s the one thing algorithms will never be able to ding. Thanks for the heads up. That’s great. Because I did not knew about this information. I have a website & I want also Google Rank. Thanks for sharing this post. I’ve always using Google as my top list in my SEO to-aim list. Thanks for always being helpful in my to-do list. I wonder if Google could use this ranking/popularity data someday in their core ranking algorithm. Thoughts, Bill? As always, thank you for a detailed explanation. It is great article for Seo and it is very helpful for my seo team. Great post!! Google product like Blogger, Google Business always my favourite. Your very clear and transparent information makes me to understand much better. Thanks for sharing this great article. Hi Periwindle – Good to hear! I read many blogs everyday and every time I came to know about many new things. Thanks a lot for nice post and share latest news with internet user. Google is vast. It contains lots of information which can’t be imagined and its algorithms always effect the websites which are doing SEO for them. Does this mean that Google+ will become more important? Because the less important it is in my life, the better. You have very nicely elaborated the facts about the rankings of users in Google. I am overwhelmed by being a part of your stream. Google is more concentrating on engagement with the posts, if you have strong relationship with your followers then getting comments and share and endorsements are very easy, and these things will help to promote Google plus as well rankings for users. hey this article is good how google rank user.this is very useful for online marketer like me. Happy to hear that you found this blog post useful.